Genea-Musings: Amanuensis Monday - Will of William White (1683-about 1780) of Dartmouth, Mass. 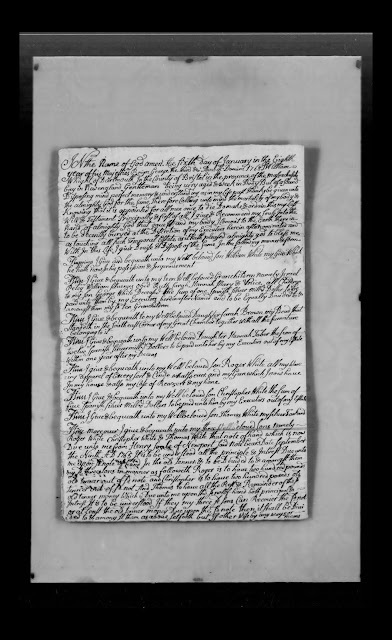 Amanuensis Monday - Will of William White (1683-about 1780) of Dartmouth, Mass. With in this Life I give Devise & Dispose of the Same In the following manner & form. he hath now In his possession & Improvement. amongst them my sd ten Granchildren. Within one year after my Deceas. In my house & also my Case of Reazers & my hone. five Spanish Silver Milled Dollers to be paid unto him by my Executors out of my Estate. Itim I Give & bequeath unto my Wellbeloved Son Thomas White my Silver Tankard. null & void & not to be paid or discharged with any other part of my Estate. tioned out of my Estate. tools he hath already in his possession. Which he now hath in his Possession. out of my Estate who therein after named. the Death of my sd Daughter Susannah. same time and are in y^e presence of y^e Testator. 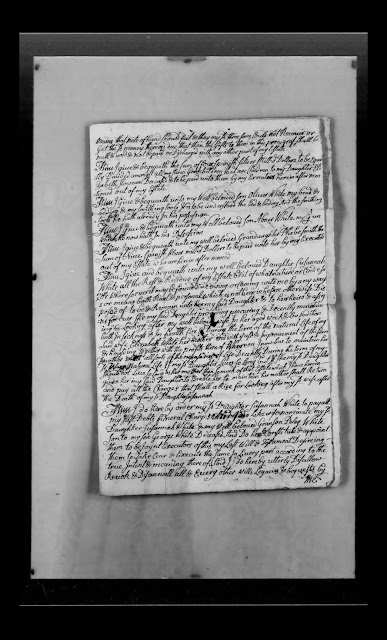 Bristol County, Massachusetts, Probate case files, Case file 28020 - William White 1780; "Bristol County (Massachusetts) Probate Records, 1636-1899," digital images, New England Historic Genealogical Society, American Ancestors (http://www.americanancestors.org : accessed 17 May 2018). William White (1683-1780) was the son of Sylvanus White (1667-1688) and Deborah --?-- (1667-after 1688). He married Elizabeth Cadman (1685-after 1768) in 1707, and they had eleven children. Son George White died before William wrote his will, and his ten children were named in the will. Daughter Elizabeth Slowcom died before William wrote his will, and the will provides for the grandchildren without naming them. The granddaughter Phebe Smith named in the will may be a daughter of one of the children, but I don't know which one. The will provides for the remaining nine children. Daughter Susannah White and grandson Peleg White (son of George White) were named as executors. Daughter Susannah White was to provide for the care of her mother, Elizabeth (Cadman) White, who probably died before 1780. It is unclear as to when William White (1683-about 1780) died. It was certainly before 3 October 1780 when his will was proved. The will of his son William White (1708-1780) was proved the same day in the same probate court. 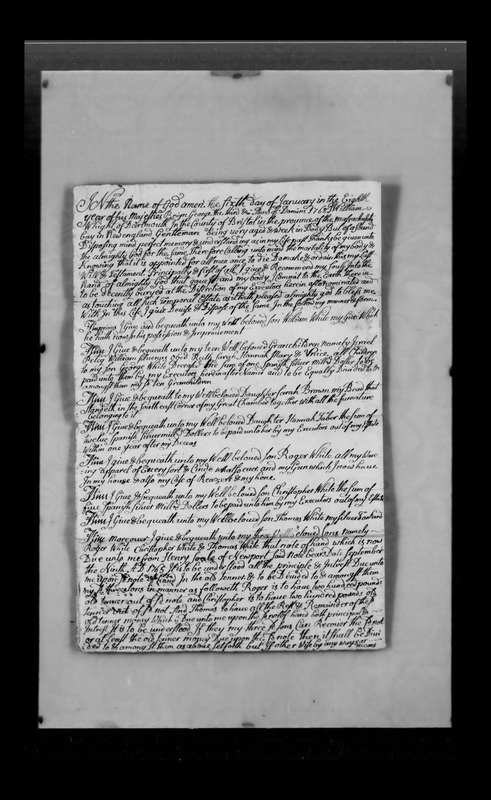 Perhaps William White 1683 died earlier but his wife died in the 1780 time frame and probate of the estate of William White 1683 was delayed until she died. 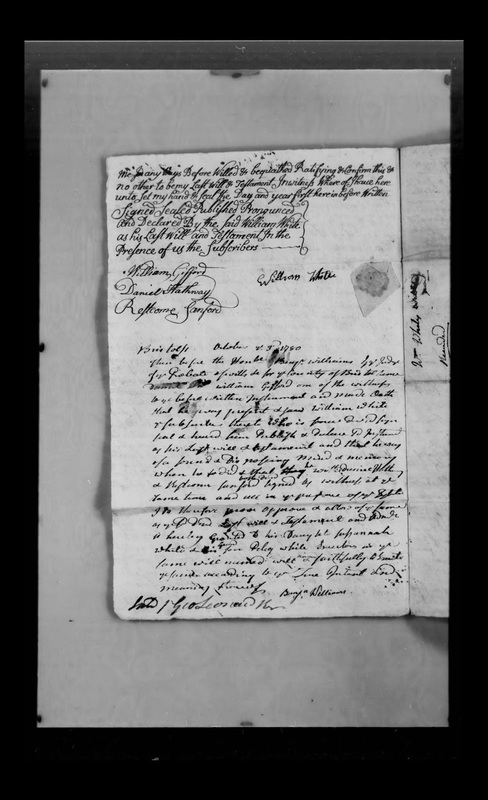 William White is my 7th great-grandfather, through his first son, William White (1708-1780) of Dartmouth, Massachusetts, who married Abigail Thurston (1700-1770) in 1729.